Product prices and availability are accurate as of 2019-04-09 06:01:18 EDT and are subject to change. Any price and availability information displayed on http://www.amazon.com/ at the time of purchase will apply to the purchase of this product. 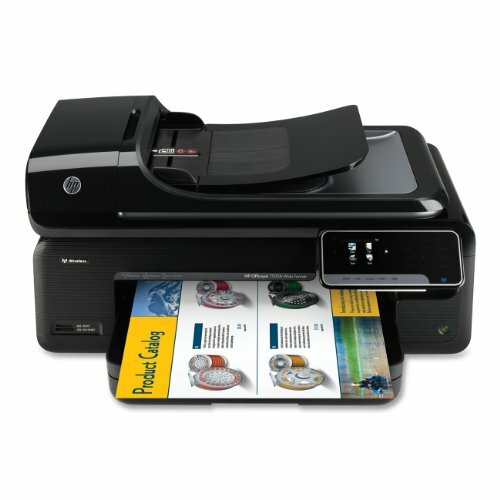 Print professional color business materials up to 13" x 19" and for the lowest cost per page vs. in-class, wide-format inkjet all-in-ones with the HP Officejet 7500A Wide Format e-All-in-One, which delivers maximum prints speeds of 33 pages per minute black and 32 ppm color. Print, fax, scan, copy - this wireless and Ethernet-ready workhorse does it all and saves you money with individual inks and high-capacity cartridges. It also uses up to 40% less energy than comparable laser products. Store your business documents on the Web and quickly access and print them directly from this inkjet printer using print apps and the 2.36" color touchscreen. You can also quickly fax files or scan to a PC or e-mail and use HP ePrint to send photos, documents and more from any mobile device directly to the HP Officejet 7500A Wide Format e-All-in-One. The HP Officejet 7500A Wide Format e-All-in-One has a 150-page, wide-format tray and a 35-page automatic document feeder and handles a range of paper types. It also meets changing business needs by allowing you to connect to your PC with Hi-speed USB 2.0.6 or print without a PC using memory card slots. Print professional business materials-from 3 x 5 to 13 x 19 inches-plus Fax, Copy and Scan with ease. Print professional color for the lowest cost per page vs. in-class, wide-format inkjet all-in-ones. Print from anywhere, anytime, directly to your HP all-in-one, using your mobile device. Use the memory card slots and 2.36-inch touchscreen to print without a PC. Save on paper, using digital faxing options.